By now, you've probably heard the news about Korean K-Pop superstar PSY's anti-American concert performances. 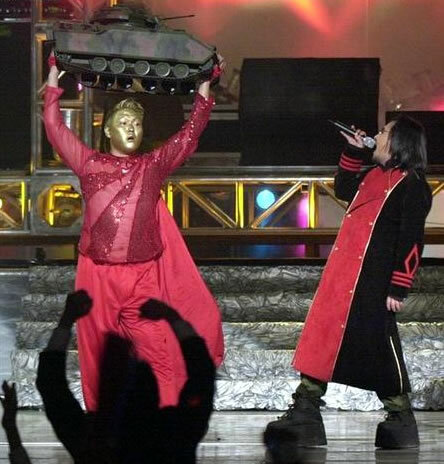 In 2002, PSY protested the deaths of two Korean girls who were hit by a U.S. convoy by dressing like the above picture and smashing the prop tank on stage. The song I was featured in – eight years ago – was part of a deeply emotional reaction to the war in Iraq and the killing of two Korean schoolgirls that was part of the overall antiwar sentiment shared by others around the world at that time. While I’m grateful for the freedom to express one’s self, I’ve learned there are limits to what language is appropriate and I’m deeply sorry for how these lyrics could be interpreted. I will forever be sorry for any pain I have caused by those words. However, people are still calling for his performance for President Obama at the Christmas in Washington event Sunday to be cancelled. In an interview with state-run newspaper Granma, Orlando Vistel, the director of the Cuban Music Institute, explained that the island's government will take licenses away from musicians that "violate ethics" rules during concerts, adding that "severe sanctions" will be administered to officials who allow such groups to perform. These measures could disproportionately affect Cuban reggaeton performers like Osmani Garcia, who have become hugely popular across the island thanks to songs with sexual lyrics and thumping rhythms that can be danced along to in a not-so-subtle way (read: perreo). This popular hit, called El Chupi Chupi, could become one of the first targets of the new music regulations. Most K-Pop borrows heavily from Western dance pop (It's worth noting that PSY studied in the U.S. at Boston University and the Berklee College of Music.) Meanwhile, Reggaeton comes from Puerto Rico and is popular across the Latin American world. There's also a past vs. present dynamic at work here. A decade ago, PSY was happy to jump on the anti-American bandwagon twice to stay in tune with the sentiment of South Korean culture. Now, his international viral hit has plastered him and his horse dance all over U.S. television, and potentially even on a stage in front of Obama. Cuba's Reggaeton censorship reflects an older generation's desire to preserve certain music traditions vs. the vastly more popular reggaeton and hip-hop genres amongst the younger Cuban generation. Despite the seeming ubiquity of popular dance music and culture across the world, lyrics still have the power to shock, offend, and spark debate. As more and more artists emerge in the coming years across cultural/lingustic boundaries and within authoritarian states, you can expect controversies like this to happen over and over again. But if you're going to write words to a song, please put a tiny bit of thought into them, okay?